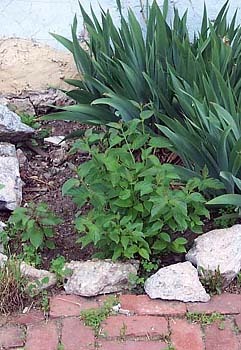 May 7, 2002 -- yellow columbines interplanted with buddleia (left); achillea summer shades (green mounds, front); dwarf columbine and young Rose of Sharon (right). 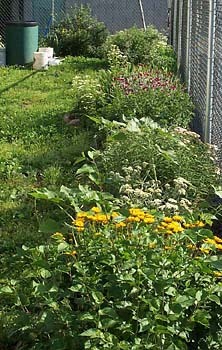 Buddleias and Rose of Sharon salvaged from compost pile of another community garden; achillea and yellow columbine grown from purchased seed; dwarf columbine grown from seed collected from neighbor's plants. 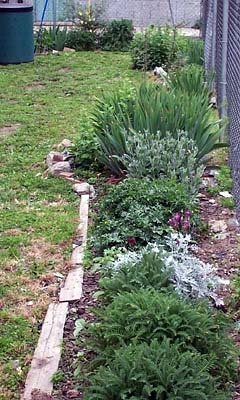 May 7, 2002--the "long bed" facing north-- achillea summer shades; dusty miller grown from rooted cutting; columbine; malva moschata purchased as $1.00 orphan plants; rose campion donated by Cornucopia bed and breakfast; iris already in lot. 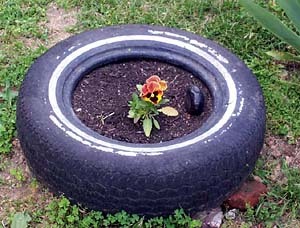 May 7, 2002 -- one use for a discarded tire. This will hold Eric's tomato later this year, but the pansy was for instant gratification. Pansy (and tomato) grown from seed. May 7, 2002 -- next to some of the iris originally in this lot, three small cornus shrubs rescued from the weedpile at Bartram's Gardens, summer 2001. We aren't sure whether they will ever bloom, but they are native and hardy. 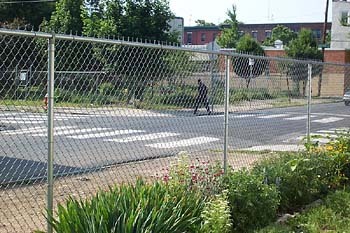 June 1, 2002 -- the "long bed," facing north. 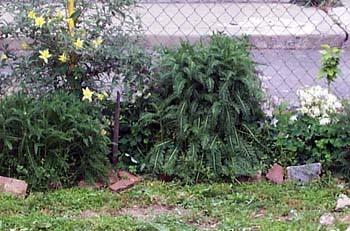 Volunteer coreopsis, foreground, transplanted from community garden. Achillea and rose campion beginning to bloom. 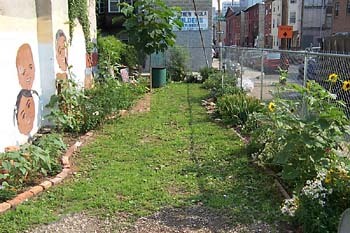 June 1, 2002 -- The community garden seen in the distance; the "long bed" is in the foreground. June 1, 2002 -- view of the long bed and the new bed, facing south. 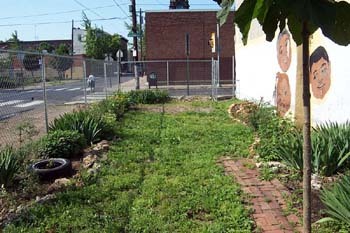 The new bed, right, is planted this year with sunflowers, marigolds, and feverfew. The Pawlonia tree, foreground right, will be sacrificed when another shade tree is found and grows to a useful size. In the meantime, it will be pruned to keep it within bounds. 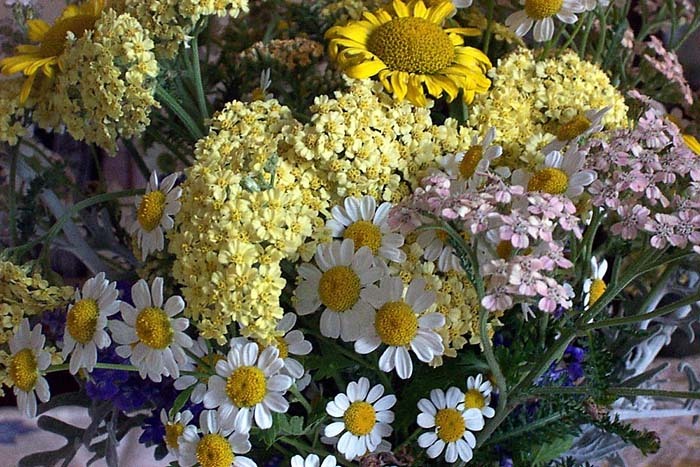 June 10, 2002 -- A mixed bouquet from the garden. 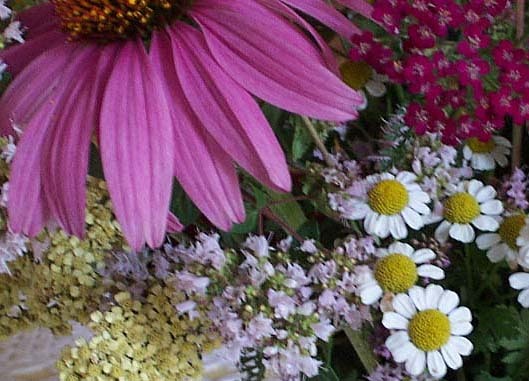 Feverfew, achillea, chrysanthemum, salvia. All grown from seed or swapped. Above: two views from the south side, looking north. To the right: looking south. 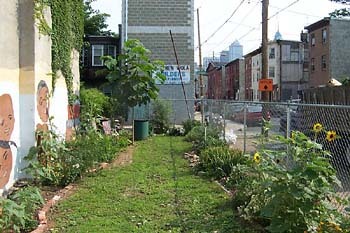 The community garden is in the left background. The feverfew and rose campion, which bloomed so profusely in June, have been trimmed back to encourate reblooming (of the feverfew, at least) later in the season. The young sunflowers in the "new" bed were planted on purpose. The others, blooming now, are volunteers. Eric's "tire tomato" is now about 18" tall. It has no tomatoes yet, but it has recently begun to bloom.